Fundraising is a big part of any high school or collegiate program. In many cases programs wouldn’t exist without the kindness of donors, supporters and good fundraising practices. There are many different ways to create fundraising campaigns, but most of them are short-lived and only apply once or twice a year. But what if there was a way to create a permanent fundraising opportunity to help your program survive and thrive? Believe it or not, it’s not only a possibility, but schools and colleges across the state and country are doing exactly that. The main reason why athletic programs have fundraising campaigns is simple: kids shouldn’t have to pay to play amateur sports. Or more accurately, the parents shouldn’t have to pay for their kids to play sports at the school they attend. Fundraising makes this possibility a reality. Many schools hold fundraising car washes, service projects and other random events to generate money. With a Sideline Interactive digital scorer’s table, however, student-athletes wouldn’t have to spend their evenings and weekends trying to raise money. 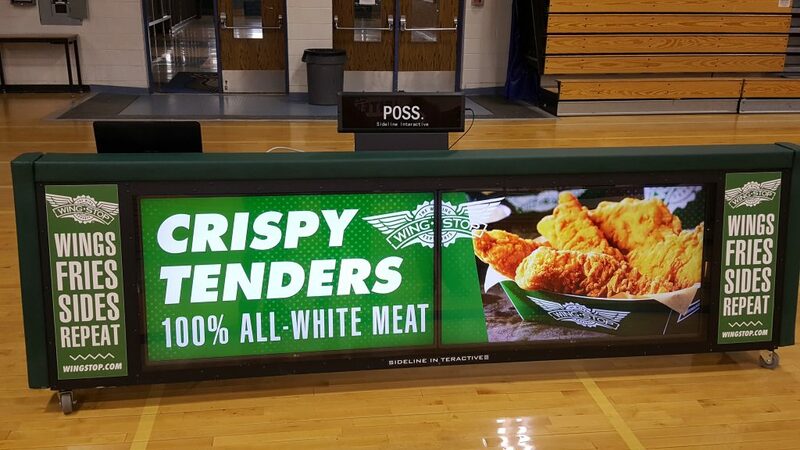 Instead, businesses would be naturally attracted to having their company logo and advertisements on the scorer’s table in your gym during basketball games or volleyball matches. The amount of advertisements you could display on your digital scorers table is virtually endless. Companies could choose the amount of time their logo is shown on the scoreboard, how often ads are shown, how large the logo is and many other features. The initial investment a school makes in a Sideline Interactive digital score table is nothing compared to the amount of money that could be raised by local businesses. In fact, most athletic programs have paid for the scorer’s table within a few weeks or months from the time they purchased it. A Sideline Interactive digital scorer’s table is such a hot commodity in athletic gyms because businesses want exposure at a reasonable price. Depending on the size of your high school or college, you could essentially display a company’s advertisements dozens of times throughout the course of an event. Most of the time, businesses are looking for different ways to support local athletic programs. However, just writing a check isn’t always the most attractive option for them to donate since they don’t receive anything in return. All it really takes is the coach of your basketball or volleyball team to ask for sponsorships for their new scorer’s table or LED display board and the sponsorship money will come. There’s a certain amount of pride in a business owner when they see their company name displayed on a digital scorers table or scoreboard during a live event. That positive exposure is great for their business since other fans and spectators see how they support the program. And even better, the business they generate from the advertising pays for the advertisement itself. 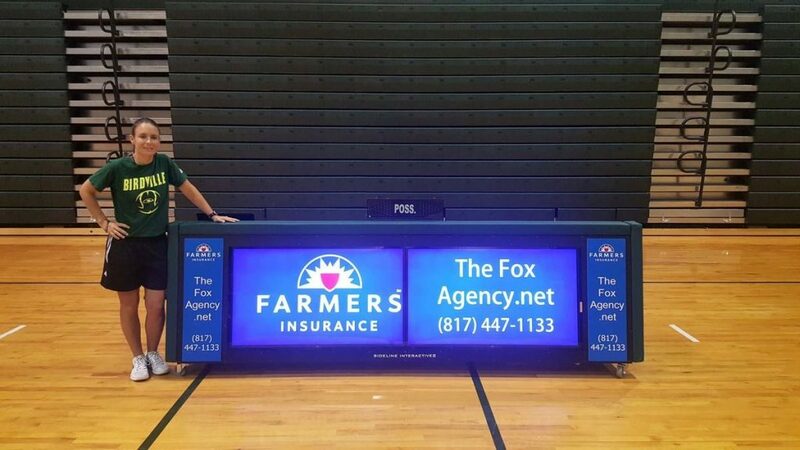 From a business standpoint and an athletic program standpoint, a Sideline Interactive scorers table creates a win-win situation for both parties. If you’re going to have multiple sponsors support your athletic program, then you need to create a fun environment in the gym to make their investment seem worthwhile. With a Sideline Interactive LED scorers table, you can run loops of videos, highlights, advertising, fan cams and much more to keep a lively environment before, during and after an event. The days of having to make posters or print out flyers to advertise for your sponsors are over. Not only do print advertisements take a lot of time and money to create, but they simply aren’t effective anymore. A digital advertisement is much more effective and attractive, and if you make your interactive scorers table something fans want to look at all the time, then businesses will be flocking to you to put their logo on the scoreboard. Every community is different. The beauty of a Sideline Interactive scoring table is you can tailor your fundraising efforts to meet the needs and budgets of local businesses. Some businesses want to support your program, but may not have much of a budget to work with. Others are just waiting to write you a check. You can create different tiers or levels of sponsorships depending on the amount of money donated. For example, you could create a “premium” level, where a business donates $2,000 or more annually and it would guarantee them a sign somewhere in the gym at all times, the company name announced before and after every sporting event, commercials and anything else you can think of. A “basic” level of sponsorship may be for a donation of $500 annually and include an advertisement on the scorer’s table that shows up only during certain times of a game (i.e. when a player hits a three-pointer, makes a dunk, serves an ace, etc.). You could also even get creative to allow parents to support their kids on the court. For maybe $100 for the entire season or $20 for a single game, the parents can have a good luck note or a birthday message for their student-athlete. This is much more effective and personal than putting an advertisement in the local newspaper, since their kid is playing a game with their friends when they see the message. It may seem like fundraising through a Sideline Interactive digital scorer’s table is too easy. The truth is it’s very easy. Coaches, administration, parents and even students across the state and country are taking advantage of the ease of fundraising so they can create an electric gym environment during all of their home games. Coaches can even ask their players to get an advertisement, and in return they may display a highlight film of them before the game for the fans to see. The point is there are many different ways for everyone within the athletic program to be involved with fundraising for the digital scorer’s table. When you have a cohesive program on the same page, the environment and camaraderie will naturally be stronger. Most programs meet and exceed their fundraising goal in a matter of weeks. But the best part about it is the advertising never stops, so the work of getting a sponsor happens once, but the benefits and money come in year after year. If hundreds of high school and college programs are having success, then why can’t your program? Working smarter rather than harder is always ideal. When you invest in a Sideline Interactive scorer’s table, you’ll be working smarter and more efficient to create a permanent fundraising campaign that will last and fund your program for many years.